K and I discovered this place when we took my little niece and nephew to swimming lessons several weeks ago. We’ve always been a fan of Burma Superstar and were curious to know what other Burmese restaurants tasted like. 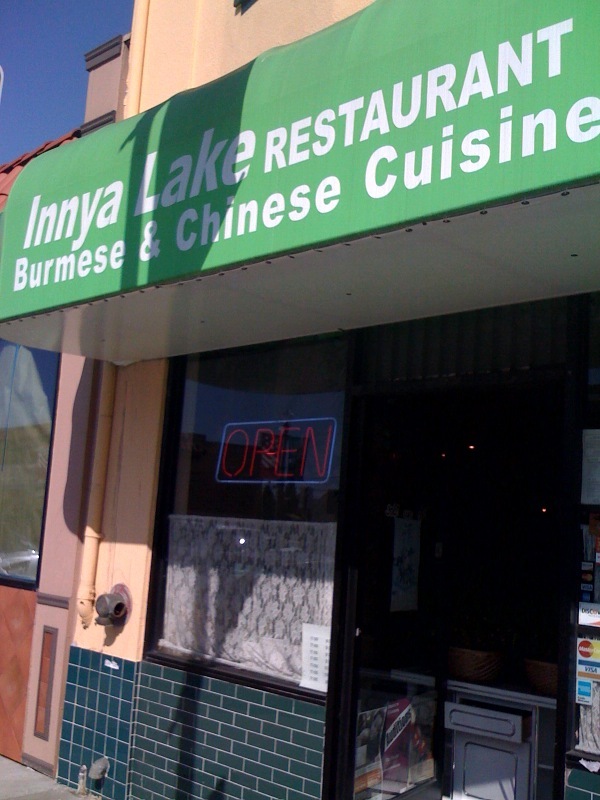 Innya Lake is a Chinese Burmese fusion restaurant that serves classic dishes from both countries. Innya did get poor reviews on their Chinese food, but the Burmese food was actually pretty decent. K and I were the only people in the restaurant. The dishes were clean and the waiter was patiently attentive at the back table of the restaurant. They spoke Chinese there and K overheard them discussing a possible closure due to poor business. Ohn-No-Kauk-Swe (Coconut Chicken Noodle Soup) – Ohn-no-kauk-swe takes your average chicken noodle soup to a whole ‘nother level. It is a very rich and creamy. This hearty soup is packed with noodles, egg and chicken with a heavy dose of coconut milk, making it soothing and comforting on a cold day. Samosas – I love these samosas. They remind me of the kind I used to buy in bulk from a woman in Daly City. The samosas are wrapped in a thin crispy wrapper and filled with a curry potato mixture. The smooth creamy inside with the crispy outside makes a tasty snack. Tea Leaf Salad – This was very different than the one I’m used to at Burma Superstar. The dish was actually very tiny and it didn’t have lettuce. It was merely fermented tea leaves, fried peas, fried garlic, peanuts, sesame seeds and jalapeños. The salad was doused with a light oil and thoroughly mixed. I thought the salad was satisfactory. I would recommend the salad at BS before this one.